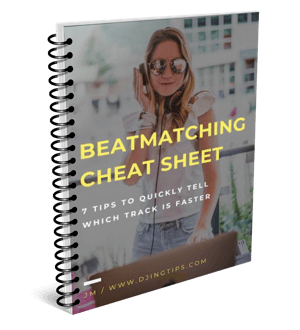 After you’ve mastered mixing in its basic form and learned to match phrases, you’ll already be able to make fairly good transitions between records. To mix like a pro, though, you’ll still need to master one essential skill: using the EQ. In this article, I’ll talk about how you can take advantage of this powerful tool to make your blends totally smooth and subtle. Technical details aside, the channel EQs in your mixer allow you to adjust the level of different frequencies (normally highs, mids and lows) in the sound that comes from the decks. And since each of the track’s elements – such as the kick drum or the vocals – often belongs to only one frequency range, the EQ allows you to cut or dampen those elements at will. The chart below lists the elements of a song and the frequency bands they normally belong to. To actually get a feeling of what I’m talking about here, play around with your mixer’s EQ and take notice of what instruments and elements of the tune the particular knob is responsible for. The channel EQs of a mixer have separate rotary controls for each of the three main frequencies (see photo). At twelve o’clock, a knob doesn’t alter the level of its frequency range; turning the knob clockwise boosts it and turning the knob counterclockwise lowers it. Some mixers also have Kill buttons (or a special zone in the leftmost position of the knobs), which cut the frequency range completely. What does it all have to do with mixing? A lot. The thing is that when mixed, the two tracks’ kick drums and hi-hats often clash with each other. As a result, even despite the tracks’ beats being aligned, the transition may still sound messy. To avoid that, the DJ first hides the potentially conflicting elements of the incoming track with the EQs and then, during the blend, replaces the old one’s elements with them. Now that I’ve covered the basics, I’m going to tell you how I use the EQ when mixing. Note that the tips below aren’t a standard of some sort; they’re just a starting point for your own experiments. OK, let’s begin. Before you start bringing track B in, cut its bass almost completely and lower its highs by about two-thirds. Then, as you’re making the transition with the upfaders, adjust the EQs to increase B’s bass while at the same time lowering it in A. Make sure to be doing the same with the highs, too. By the end of the transition, you should end up with the dancefloor hearing track B only, with all three of its EQ knobs at twelve o’clock. 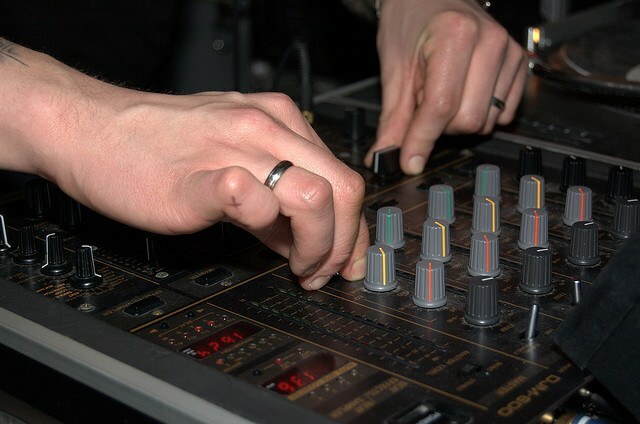 Since you’ve only got two hands, you’ll have to be manipulating the faders and the EQs by turns. Start the transition from A to B as usual – by moving the channel faders. After track B becomes discernible on the dancefloor, forget about the faders for a moment and extend the transition to the realm of the EQ by starting to gradually increase B’s bass and lower A’s. Then you may return to the faders, and then, after a while, turn your attention to the highs. Your hands will end up going back and forth between the faders and the channel EQs, advancing the transition here and there. Bringing in on the highs. Sometimes there’s a melody element in track B’s intro that’s nice to announce right in the beginning of the transition. If that’s the case, you don’t lower B’s highs but as you’re bringing the new track in, you gradually dampen them in A so that the two channels’ highs don’t clash. The blend begins at 00:07; note how I announce the new track right away with its distinctive tinkling. Swapping the hi-hats. Same as the previous trick, except that you do it with the highs. The EQ allows you to make really smooth and unnoticeable transitions between records. At the same time, a full account of DJ’s actions during a blend may be pretty intimidating. The disc jockey has to work the channel faders, handle the EQs, monitor the sound in their headphones from time to time, as well as track and fix any beat drifting. The good news is that if you practice, take it slow and don’t give up, you’ll be able to make all these various DJing skills fully automatic. And the day will come when you’ll suddenly realize that you’re able to mix like a pro, effortlessly. I have been practicing DJing for almost an year now and have played at numerous events and house parties. I have my first show at a club in 2 weeks. Since the starting, my buddies who stay with me, hear me practicing or mixing new tracks, tell me that when I change the tracks, they get to know about it while transition. They say some of them blend in so smooth that you wouldnt even notice. But others they say when I bring the new track in, they know the track is changing. I play house, dubstep and hip hop. Their complain is mostly during the hip hop section where I am a newbee. Please provide your expertise. Hi Arvin, I don’t have much experience mixing hip hop. However, what I have to say is this: DJing is not a competition in making the transitions as subtle as possible. Neither is a successful DJ judged by whether his audience notice a new track coming in or not. Your transitions should be good enough, but your taste, the selection of tracks that you play and the ability to control the dancefloor are no less important. A two-third deduction for bass would be the bass knob at about 8 o’clock. I.e. mostly off, but not quite. I normally don’t care much about meds during a transition but if there is a clash, you can lower the meds on the incoming tune and then swap those in. Phrases can be longer in trance (up to 32 bars). The rule of the thumb is that a phrase is the interval at which big chances take place in the particular piece. Hi and thank you for a good tutorial. What is the name of the two tracks that you are using in your example in your mix in this article? Hey Alex, sorry for a late response – it was summer after all 🙂 The tracks are VMC – To The Rock (DJ Spen & The Muthafunkaz Praise Party Vocal) and Kathy Brown – Get Another Love (Warren Clarke Club Mix). Hi, JM. I am new in Dj and this is my first mix. Can you comment it by emai. It’s very helpfull yours lesons. Thank you. Hey JM. Great tips. I came to this article hoping you might have some information on using filter knobs for mixing. What are some tips and techniques for using the filter during transitions?